Mostly I have a one track mind when it comes to a Japanese restaurant. I still go to my favourite one that is in Scarborough, Super Sushi that I have discovered when I came to Canada 15 years ago. But when I moved to North York, I often only get it when I visit my sister. For years I have promised myself that I would find an alternate here in North York, which should not be so hard to do as my neighbourhood is Asian-centric. And last week I think I finally found it, less than 10 minutes from home. 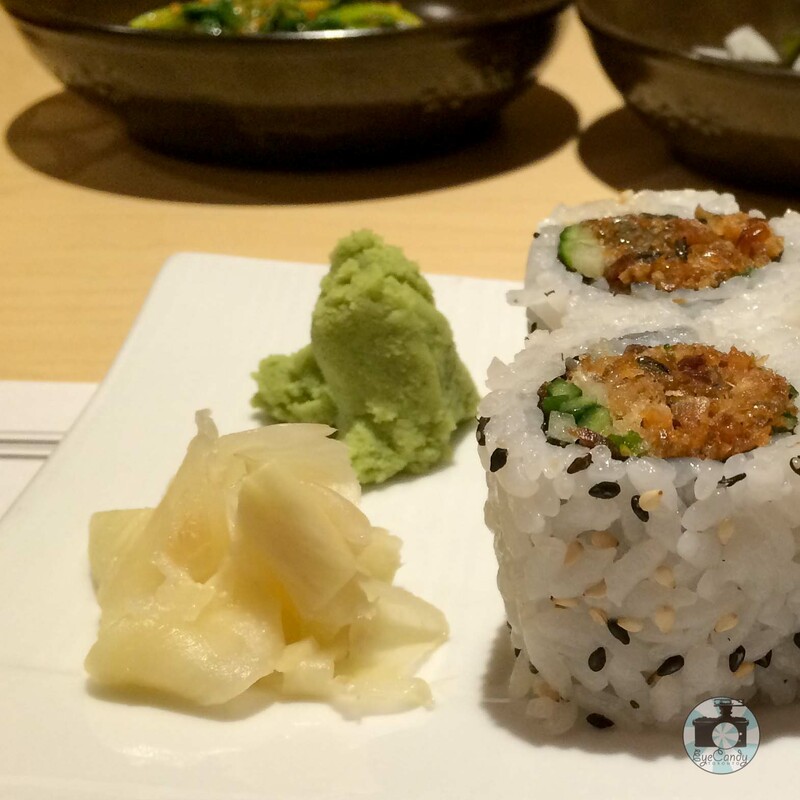 Last week I tried Marado Sushi. That day I forgot to eat lunch (again) and I was starving as I was doing errands after work. Countless times I have gone to that mall as I visit Paramount Restaurant and I didn’t see it. I guess those small tiny nuggets of baklava can distract the most serious of foodies. As I walked in, just like any other, there were banquet seating and private cubicles with discreet curtains affording some privacy. I chose to sit on one of the regular banquets and ordered shrimp tempura and crispy salmon skin maki. I tend to measure how good a Japanese restaurant was by the lightness of their tempura batter coating a perfectly plump and fresh, sweet shrimp. To be able to have it light and crunchy on the outside without overcooking the shrimp on the inside is definitely a good sign. As I waited for my food, I was pleasantly surprised that they have banchan (Korean small dish appetizers) to tide me over. Instead of the more conventional miso soup, I got a small noodle soup in clear broth. It was indeed comforting to have something warm and clean to whet the appetite. Not that I need more motivation to eat. If the tempura did not arrive promptly, I would have happily finished them all.